We want you to be efficient, productive and happy. That’s why we attach our exclusive Think Beyond Tomorrow Guarantee to all new equipment acquisitions. Available only for Infomax customers, we offer our guarantee on top of any guarantees or warranties granted by a manufacturer. It’s a safe decision that extends the life of your machines by assuring superior service and performance at no additional cost. Our Think Beyond Tomorrow Guarantee is included free with all new Infomax equipment that you buy, lease or place on our PrintMax Plus Matrix Program. With no added cost, you benefit from better dependability and fast, quality repairs performed by our factory-trained Infomax technicians. 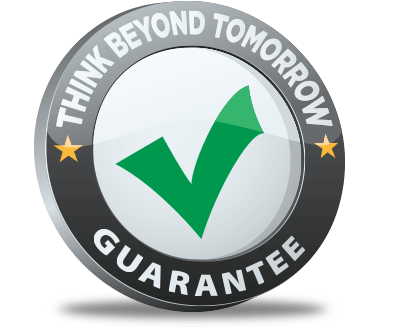 The Think Beyond Tomorrow Guarantee is an advantage that only Infomax customers have, because only Infomax offers anything like it. Due to our unwavering commitment to providing businesses with expert service and value, our machines are up and running 98.5 percent of the time – one of the most enviable rates in the country. If you call in an issue with your equipment, we’ll return your call within one hour or less. Our support desk will assess the problem, and if necessary, advise you on when a technician will arrive at your office. If we are unable to fix your machines on site, Infomax will provide you with loaner equipment at no cost until the problem has been resolved. If we, or our equipment, fails to live up to your expectations based on our agreement, give us written notification and up to 30 days to rectify the situation. If you are still not satisfied, we will remove your equipment and replace it like for like. If you own or lease your equipment, we will offer to trade it in for our Guaranteed Equity Value against new, updated equipment. If you are a current Infomax finance customer, you have the option to cancel your existing agreement without penalty and receive a new agreement with updated equipment. *The Infomax Think Beyond Tomorrow Guarantee is valid only under conditions within the control of Infomax Office Systems, Inc., and does not apply to cases of misuse or negligence. The guarantee applies as long as: all customer supplies for that equipment are purchased exclusively through Infomax; the equipment is kept continuously under a full-maintenance agreement with Infomax; and the customer’s account remains current with Infomax Office Systems, Inc.